What’s the key to healthy eating? Cooking more often! It’s a great way to develop healthy eating habits. Cooking for ourselves lets us control exactly what goes into our meals – and choosing healthy ingredients like fruits, vegetables, whole grains and protein foods is a great place to start! Short on time during the week? That’s where meal prep Sundays come in. Meal prep not only saves you time, it also helps to save money on meals you might otherwise eat out. When it comes to prepping protein foods, why not try eggs? When properly stored and refrigerated, prepared egg dishes will stay good to eat for up to four days, and hard boiled eggs for up to one week. If you’re an avid meal-prepper you know that the hard part isn’t making the food, it’s deciding what to make. That’s where we come in! Check out these 5 lunchtime meal prep ideas that will make your mornings easy, every single day of the week! 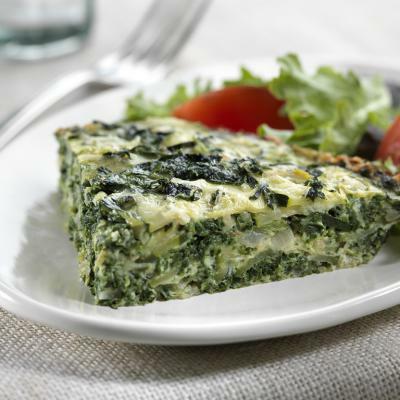 There are many reasons why we love basic frittatas! Our favourite reason: they are endlessly customizable. 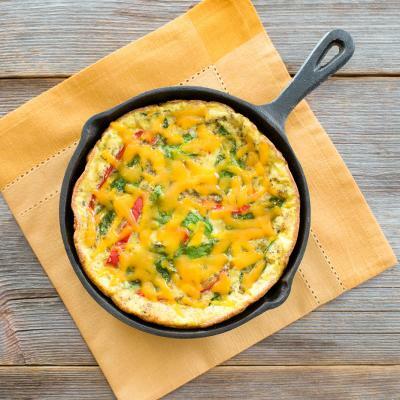 Whether you choose your favorite vegetables to add in advance, or simply use up leftover vegetables from the fridge, frittatas are truly the best vehicle for adding more veggies into your meal. 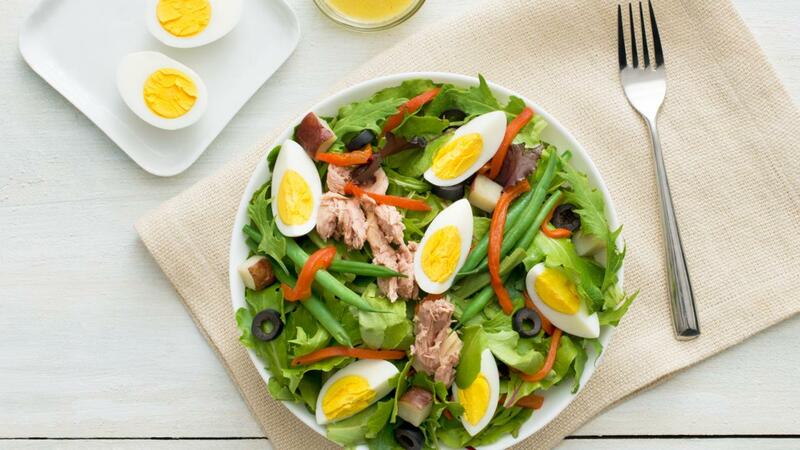 When it comes to hearty salad, nothing beats a Nicoise! 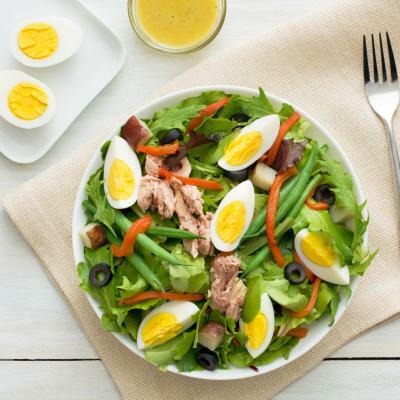 It’s protein-rich with hard boiled eggs, tuna, olives, roasted red peppers, green beans and red potatoes. Pro tip: Keep the lemon and Dijon vinaigrette separate from your salad until it’s time for lunch, then drizzle it on right before eating. This will help keep the veggies in the salad nice and crisp! Everything is betta with feta! 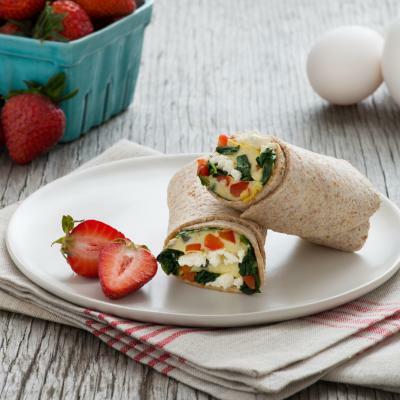 Spinach, Feta and Red Pepper Wraps and the perfect grab-and-go for crazy busy days. Simply prep the ingredients in advance and wrap it all up in the morning before you head out for the day! Put a fun twist on a classic! 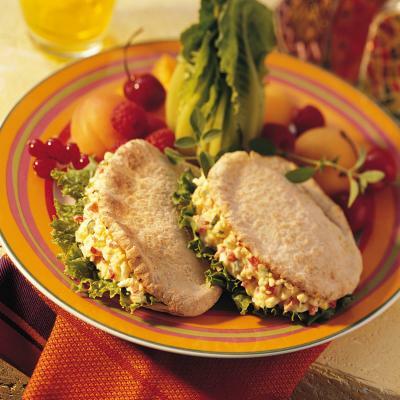 This egg salad pita is filled with red pepper, celery, green onion, fresh basil, and light cottage cheese! Best part is you can make a batch on Sunday, and quickly assemble it on a busy morning. Bacon and eggs just got an upgrade! 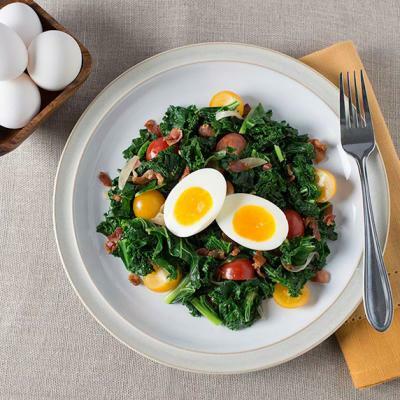 This salad made with kale, grape tomatoes and pancetta topped with perfectly soft-boiled eggs will fill you right up to conquer your afternoon hunger. Simply boil the eggs, fry the bacon and chop everything up on Sunday, making putting the salad together a breeze Friday morning before work!